Tannahill played quarterback up until his junior season, but his best year in the league came when he was the Hawks' starting tight end as a senior. He's gone on to play at K-State where he's been a two-year starter at tight end. Goodger was a first team all-league selection at both tight end and defensive end as a senior, so there was some question as to what he would play in college at Minnesota. He was immediately slotted to the tight end position for the Golden Gophers, and he even earned playing time as a freshman. 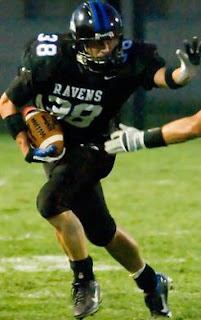 Swartz earned first team all-league honors as a tight end as a junior in 2009, then received second team all-league honors, behind Gooder, as a senior. While he was most recognized for his efforts as a linebacker, he was an animal when it came to blocking and he had a knack for making big catches. I slotted Gentry as a tight end because the way Olathe North used him the past few years reminded me of how Missouri used tight end Chase Coffman back in the day, splitting him out wide to create a height advantage. Gentry was a tremendous pass catcher and the Eagle's top threat through the air the past two years. in 2007. Photo courtesy Jeff Phillippi. Patch spent the majority of his time blocking, but he was the favorite target of quarterback Tyler Lawrence during the 2005 season. Patch's most memorable moment came when he caught a 45-yard touchdown pass on SM West's opening drive against Olathe East in the Sectional Round of the 2004 playoffs--a touchdown which set the tone for one of the greater upsets of the past 10 years. Williams, like Swartz, was more known for his efforts on the defensive side of the ball, but he put up great numbers as a tight end as well. As a senior in 2007 he caught 38 passes for 513 yards. Underwood, in the form of most SM West tight ends, spent the majority of his time blocking and almost played the role of a third offensive tackle. He did, however, pose a solid threat as a receiver and he was a First Team All-Sunflower League selection as a tight end and defensive end in 2005. Murray excelled in SM Northwest's quarterback friendly offense of the mid-2000s, catching passes from quarterback Alex Carder and making bone-crushing hits whenever he could. He was a Second Team All-Sunflower League selection at tight end in 2007, behind Tannahill. Ballard plays in the NFL for the Minnesota Vikings as a defensive end, but during his high school days he was more well-known for his efforts on the offensive side of the ball. He was a First Team All-Sunflower League selection as a tight end in 2006. DeBiasse was a would have put up better offensive numbers, but he played back when the Chesty Lions still used their traditional old school offensive approach. He was still an all-league performer as a tight end in 2006 despite the limiting offense. 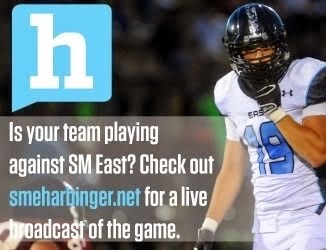 I heard something crazy about Olathe East having to forfeit all of their wins because of an ineligible player. Know anything about that? Preps KC is reporting that Gene Weir is returning to Olathe North after being let go in Texas.